The Italian brand is working the ugly-chic sandal trend with its limited edition Fussbett model. The 'Fussbett' sandal gets its Teutonic name from the Anatomic insole beloved by fans of Germany's Birkenstock brand. The shoe comes in a glitter-glazed gabardine, featuring micro-sequins and patent leather piping, a velcro closure and a rope and rubber sole, with a special mulberry and granite-colored limited edition available online from Monday via Marni for €390. The ugly-chic sandal trend has been brewing slowly over the past few seasons. First up, London's Christopher Kane sent his models out in metallic pool slide-style sandals with chunky soles for Spring-Summer 2012. Then, at Céline Phoebe Philo created plenty of gasps with her Spring-Summer 2013 fur-lined Birkenstocks (the brand has been an inspiration to plenty of designers of late). She followed up the trend a year later with her Spring-Summer 2014 thick-soled sporty sandals with gladiator strapping, a more wearable option, perhaps. 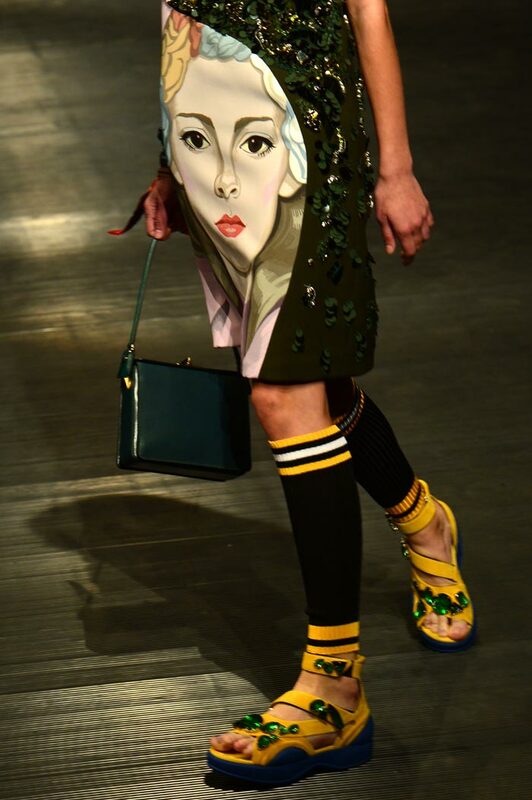 Prada's Spring-Summer 2014 collection was also packed with the trend, featuring simple, chunky injection-molded rubber soles and velcro straps. They also come with an added dose of glamor, provided by the colorful giant crystals applied to the straps. Sporty-sandal fever hit New York City too, with Marc Jacobs sending out rubber soles and glittering sports straps for Spring 2014; shoes which are currently hitting stores.